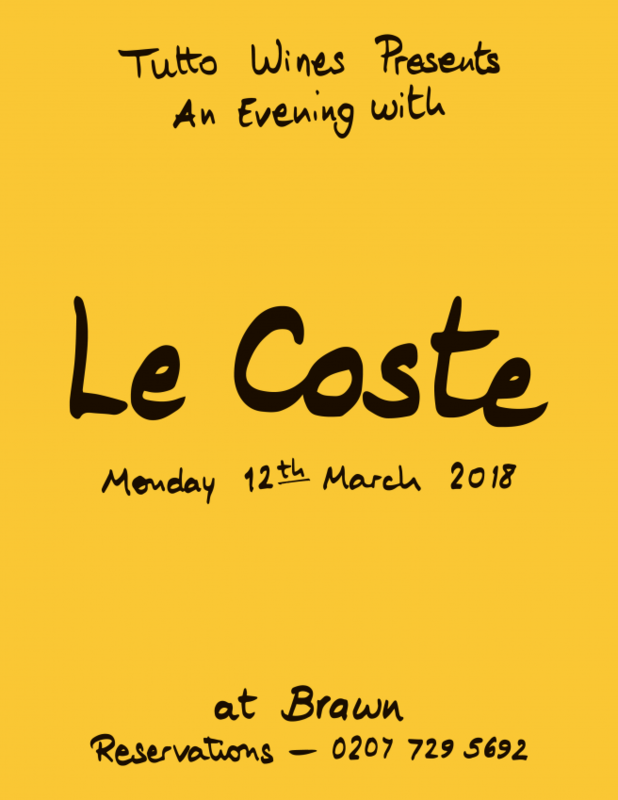 On Monday 12th March we will be hosting a very special dinner with one of Italy’s great producers, Gianmarco Antonuzzi of Le Coste at Brawn. He and his wife Clementine tend around 14 hectares of land, with vineyards amongst a warren of olive groves, chestnut trees, shrubs and oaks around the volcanic Lake of Bolsena near Gianmarco’s childhood town of Gradoli in Lazio’s north. Vines are planted at a density of up to 10,000 plants per hectare, on both massale selections and ungrafted stock. Everything is done by hand, with careful attention to the needs of each plant and while some biodynamic principles are employed, the approach here goes above and beyond. Each year they produce a dizzying number of different wines which are vinified in an ancient cellar in the village’s centre, with no additions at all. Gianmarco is a master of elevage and a real patience in this respect results in some of the purest, most delicious wines we have tried. On the night, Gianmarco will be digging deep into his cellar and pouring the rarest of rare cuvées such as PNT, Lulù, Ninì, Lot 20 & Due M, alongside favourites Litrozzo, Bianchetto, Bianco, Rosso, Le Coste, Le Vigne Più Vecchie’ & Alea Jact Est from bottles big and small. To accompany the wines, Brawn’s chef Ed Wilson will be taking his cues from the classics of cucina romana. It promises to be a wonderful evening. To join us, simply call the restaurant on 020 7729 5692 to book your table.